Founder of the giant conglomerate Grupo Televisa – the world’s largest Spanish-language broadcaster and perhaps the most prolific producer of TV programming in any language – Emilio Azcárraga Milmo (1930-1997) was Latin America’s answer to Rupert Murdoch. He inherited a TV and radio company from his father and turned it into a multifaceted colossus, involved in publishing, pay-TV, film, video, popular music, soccer, and the fine arts, as well as broadcasting. He socialized with presidents and helped shape the political trajectory of Mexico. He became the richest man in Latin America. He consistently generated controversy, through his voracious and monopolistic approach to business, his fiery and paternalistic style of corporate management, his support of the “perfect dictatorship” enjoyed for decades by Mexico’s Institutional Revolutionary Party (PRI), his extravagant lifestyle and his incorrigible womanizing. In the Spanish-language biography El Tigre: Emilio Azcárraga y su imperio Televisa, Andrew Paxman and Claudia Fernández explore the turbulent life of this charismatic but secretive magnate and trace the evolution of his gargantuan company, from the initial founding of a radio station by Azcárraga’s father in 1930 to the present day, with the third generation of the dynasty now at the helm. They also study the traditionally symbiotic relationship between Televisa and the PRI; they examine Azcárraga’s influence upon lawmaking, the church, the arts and Mexico’s relationship with the United States; and they survey the evolution of the telenovela, the popular and much-exported form of soap opera that was the principal building block with which Azcárraga turned Televisa into a multi-billion dollar business. A joint publication from Grijalbo and Raya en el Agua, El Tigre is unique as an unauthorized biography of a Mexican businessman. It both casts an unprecedented light upon the covert world of upper-echelon Mexican business and reveals the little-known vulnerability and humanity of a man widely regarded as having been omnipotent. It seeks to encourage debate of a variety of issues, including political privilege, broadcast regulation, private sector feudalism, the democratization of Mexico, and racism, classism, and sexism in the media. It also looks at Azcárraga’s key role in the development of the U.S. network Univision, which was founded by his father. 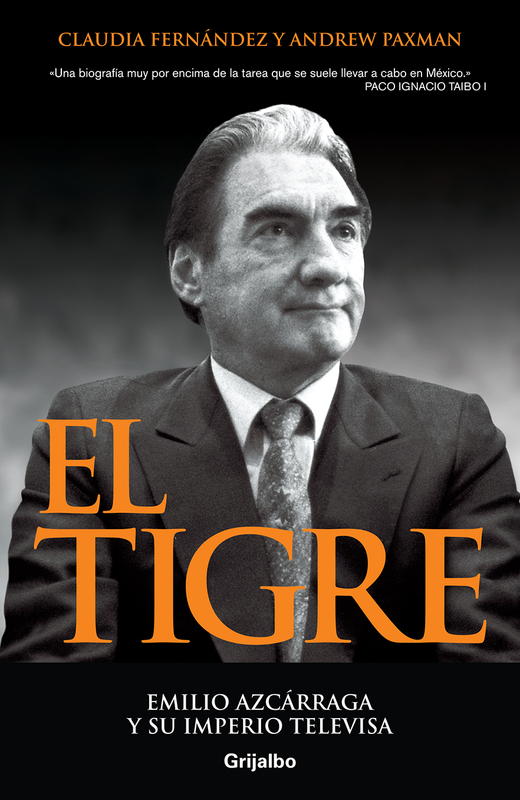 Based upon extensive research and interviews with more than 200 people – from former presidents of Mexico to current TV stars – El Tigre offers comprehensive and impartial insight into the life and legacy of Azcárraga Milmo, arguably the most influential Mexican of the second half of the 20th century. The book contains 32 pages of photos, many of them loaned by friends of Azcárraga and previously unpublished. El Tigre was first published in February 2000. According to the Mexican newspaper Crónica (27 Dec. 2000), it was Mexico’s #2 bestseller – and the bestselling work of non-fiction – for the year 2000. A pocket edition came out in late 2001, complemented online by extensive annotations for consultation by researchers and students of Mexican and Hispanic television. Together, the two versions sold around 70,000 copies. After several years out of print, El Tigre reappeared in a third edition, revised and updated, in July 2013. This edition includes a new preface that analyzes the political influence, business trajectory, and social role of Televisa under current owner/president Emilio Azcárraga Jean; following the story of Mexican TV from 2000 through to spring 2013, it considers the remarkably durable legacy of Azcárraga Milmo and the contribution of Televisa towards the election of President Enrique Peña Nieto in 2012.